The beaver might just be nature’s greatest engineer. Excavating, logging and building landscapes, beavers are incredible environmental change agents. “Busy as a beaver” is surely an apt expression as these semi-aquatic, mostly nocturnal animals display astounding industriousness when damming bodies of water and building lodges for themselves and their families. 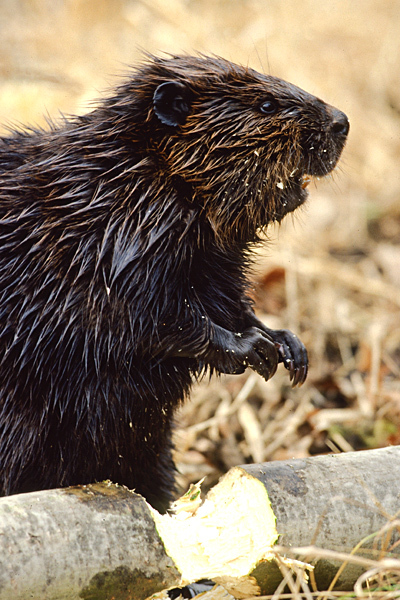 North American beavers live in Canada, large portions of the United States & northern Mexico. Eurasian beavers can be found in Czech Republic, Germany, Poland, Slovakia and parts of Scandinavia, although the Eurasion beaver was nearly hunted to extinction at one point. Beavers are herbivores and mostly eat leaves and bark and aquatic vegetation. Beavers form monogamous couples and both males and females raise their young. These beaver “kits” generally leave their lodge after their first year, during which the mother usually stays with them while the father protects the territory. Beavers will defend their territory when necessary. After another year, beaver kits usually leave the home to mate and dam a territory of their own. Beavers create dams in order to facilitate the creation of deep-water ponds to protect themselves against predators. Beavers have incredibly powerful jaws and teeth (which appear orange because of iron fortification in the enamel) and will fell trees in order to build dams in bodies of water. Beavers then will build a lodge at the center of the manufactured body of water. Why did beavers become endangered? Beavers were hunted excessively in the late 1500s because of the desirability of their thick fur as elements of clothing and hats; beavers were also killed for gland secretions that were used as medicines and perfumes.